STATE collusion was a “significant feature” in a loyalist gun attack which left six men dead in Loughinisland in June 1994, according to a new report published today by the Police Ombudsman for Northern Ireland. Michael Maguire said the protection of informants and catastrophic failures in the police investigation meant he had “no hesitation in unambiguously determining that collusion is a significant feature of the Loughinisland murders”. Dr Maguire found that there “was a `hear no evil, see no evil, speak no evil’ approach to the use of informants, which potentially frustrated the police investigation into the attack”, though the investigation was characterised by “incompetence, indifference and neglect”. In a further development his 160 page report reveals security force wrongdoing in relation to a major loyalist arms smuggling operation, subsequently linked to numerous other killings. On the infamous Loughinisland attack the report found: “The RUC investigation of the Loughinisland murders is punctuated by unexplained delays in arrests; the loss of potential forensic opportunities; and what might be described as inconsistencies or anomalies. 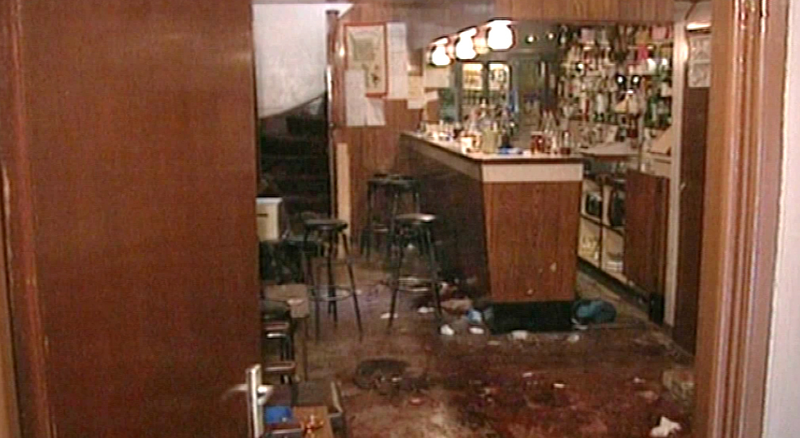 The murders took place in the Heights Bar in Loughinisland when UVF gunmen opened fire on people watching the Republic of Ireland play Italy during the 1994 World Cup in America. The men killed were 87 year-old Barney Green, his nephew Dan McCreanor, Adrian Rogan, brothers-in-law Eamon Byrne and Patrick O’Hare and Malcolm Jenkinson. The latest report comes after Michael Maguire dramatically scrapped his predecessor Al Hutchinson’s investigation into the murders and ordered a new inquiry into the killings in December 2012. As previously reported by The Detail the original investigation had been branded a whitewash by the victims’ families when it was published in 2011. But significantly, today’s findings also highlight a failure by security forces to act on intelligence around the importation of weapons into Northern Ireland involving senior members of the loyalist UVF, UDA and Ulster Resistance. While portions of the haul were seized, the rest of the weapons were later linked to scores of other killings during the Troubles. The report recounts how in late 1987/early 1988 loyalists imported the weapons haul including VZ58 assault rifles, Browning type 9mm semi-automatic pistols, tens of thousands of rounds of ammunition, hand grenades and rocket launchers. Dr Maguire found that two of the weapons connected to the Loughinisland attack were from the shipment, including the main firearm used in the killings which was a VZ58 assault rifle. He found that weapons from the shipment were also linked to “at least 70 murders and numerous other attempted murders” by loyalist paramilitaries. Commenting on this Dr Maguire said: “Despite being implicated by intelligence in the importation of these weapons, senior members of the UVF, UDA and Ulster Resistance were not subject of police investigation. "This can be attributed to a decision by [RUC] Special Branch not to disseminate the intelligence implicating these individuals, amongst whom, as I have observed, there were informants. The report also cites security force failure to act on the role of a now deceased former RUC Reserve Constable, James Mitchell, whose Co Armagh farm is identified as being a hide for the weapons. The ombudsman's report said that within two hours of police detecting a portion of the arms in a convoy of cars, Mitchell was warned his property was to be searched and the remaining weapons were then moved. This also raises questions about the so-called Glenanne gang, linked to James Mitchell and made up of loyalists and security force members, the gang has been blamed for 120 killings on both sides of the border. While the ombudsman’s investigation did not find any evidence of specific intelligence about an intended attack on the Heights Bar in Loughinisland, it did highlight that intelligence was not disseminated in respect of incidents prior to the attack. According to Dr Maguire this was “sometimes designed to protect informants and meant that valuable intelligence was not provided to those charged with investigating the attacks”. The report found that sources were not asked for information which could have “prevented attacks such as the murders at Loughinisland”. The ombudsman’s investigation also highlighted the loss of investigative material as being detrimental to the hunt for the killers. Records relating to Loughinisland were found to be among those destroyed following asbestos contamination at a police barracks in Armagh in 1998. The report found that the RUC had failed to keep an inventory of what was stored in the basement of the police station and the possibility of professionally cleaning each document was dismissed on the grounds of cost. The files affected were subsequently destroyed. The ombudsman’s investigators said there was evidence which makes it clear that RUC senior management were aware that there were sensitive documents when the contamination was discovered. The report said that it is likely that the interview notes in respect of suspects for the Loughinisland murders were among those contaminated and subsequently destroyed. Dr Maguire said that during the Troubles police faced immense pressure as a result of the scale of violence. In his finding of ‘collusion’ in the Loughinisland case, the ombudsman said he used a similar definition to that used in the Smithwick Inquiry which found collusion between the Garda Síochána and the IRA in the killings of two senior RUC officers. The initial investigation into the murders at Loughinisland was characterised by “incompetence, indifference and neglect”, despite assertions by police that “no stone would be left unturned to find the killers”. Within 24 hours of the attack, details of the suspects had been identified by police Special Branch, but there was a "significant delay in arresting suspects, with the result that evidential opportunities were lost". One of the suspects initially identified as being invovled was an RUC informant. The ombudsman deemed it a matter of “significant concern” that Special Branch failed to pass on intelligence into the activities of loyalist paramilitaries thereby protecting individuals, who continued to commit serious criminal acts, from “effective investigation”. The UVF unit implicated in the murders was not the subject of a policing response sufficient to disrupt their attacks. According to the report the failure to disseminate information to investigators was “an attempt to protect the sources of that information” and this “undermined investigations”. When en route to the Heights Bar following the attack, a police patrol recovered what they said looked like a rag discarded from a vehicle. This was submitted for examination but the report found that there is no record of this examination ever taking place. The report also said evidential opportunities were lost around the killers’ getaway car, citing ‘negligence’ in the handling of the vehicle that was subsequently destroyed by police, as previously reported by The Detail. On 24 August 1994 police received information that members of the gang, which officers had suspected had been responsible for the murders at Loughinisland, were informed on 21 August 1994 that they were liable to be arrested the next morning. Intelligence the following month stated that the source of this warning was a policeman but the ombudsman found no evidence that efforts were made by police to investigate this information. The police investigation of the Loughinisland murders categorised in excess of one hundred people as suspects. One of the suspects identified by the police was an informant for the RUC at the time and the ombudsman found that they “continued in this role for a number of years after the Loughinisland attack”. The murder investigation was also passed information that on 18 June 1994 a prison inmate had been heard to tell others prisoners “watch the news this weekend, there will be something big”. The report found that the individual was never spoken to by police. RUC Special Branch in the area had its "main focus" on the IRA, though began receiving information about loyalists in south Down after the 1988 murder of Dundrum building contractor Jack Kielty, but "most of the information" received from 1993 onwards was not passed to detectives investigating a series of attacks. Commenting on those who carried out the Loughinisland killings Dr Maguire said: “Let there be no doubt, the persons responsible for the atrocity at Loughinisland were those who entered the bar on that Saturday evening and indiscriminately opened fire. Click here to see The Detail's previous investigations into the circumstances surrounding the murders in Loughinisland. The ombudsman's full report can be accessed here.